Felted Button - Colorful Crochet Patterns: Delicious Squares are Squarilicious! It's yummy. It's got colorful squares. It's Squarilicious! 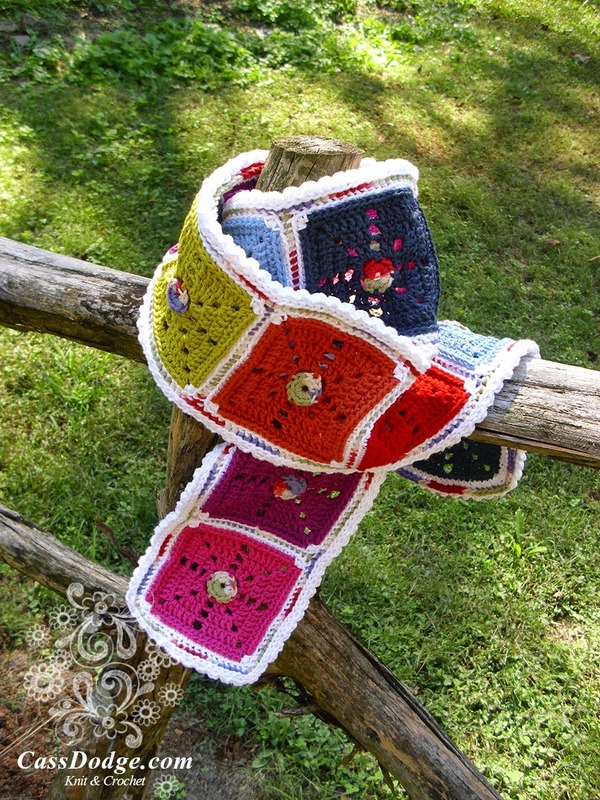 Introducing the Squarilicious Blanket crochet pattern! I'm super excited about this new design. It's one of those fun patterns where you have texture, color, enjoyable crocheting, and a fabulously versatile and textured result! the little "candy" dot centers? They remind me a bit of lifesavers or something from Candy Crush. But the little rainbow that peeks between the yellow is really fun, too. It is essentially reversible--the back with the raised ridge looks as nifty as the front, plus adds texture. Now let's talk versatility. I always try to provide options for playing with color and size with my designs. This one is no different. I made it with Baby Bee Sweet Delight from Hobby Lobby in 9 colors for the main squares. (Very affordable and lots left over to make it bigger than this crib-sized sample.) But you can make it in any colors that suit you. This pattern is now available in my Ravelry, Etsy or Craftsy stores. And did I tell you that you can save $3 on Ravelry when you spend $16.50? That's nearly 20% off. Just enter code SAVE3 at checkout for your discount--good every day! I've got a super design on my hook, one swirling in my head, and one that is ready to release. But I can't show you that one yet...because it is my Design Wars entry!! Oh, I'm silly excited about this one!! You'll see it first on my Facebook page so follow along and stay in the "Button" loop! | On the Board | -- Eat your veggies. Wear your seatbelt. Don't pick your nose. And be nice to your brothers and sisters. Adorei e levo a amostra!!! Thanks, BJ!! You are so sweet! I love it. So beautiful and colorful. Hi Susan! Another wonderful design!